Yuhu! The New Variants Are Here! Great News for Sellers! 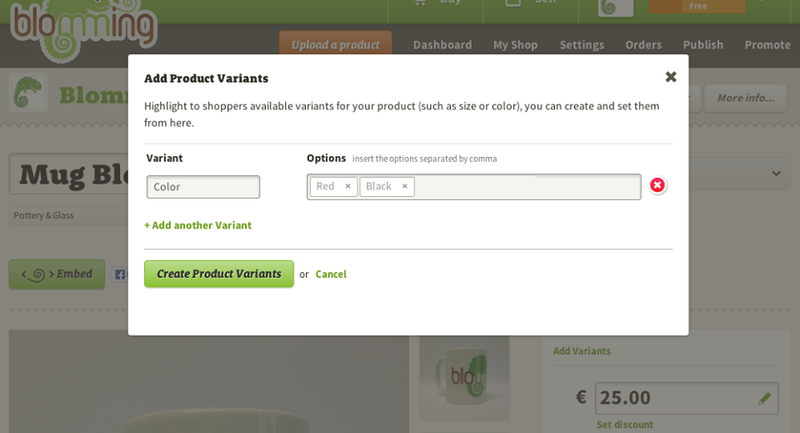 One of the most requested feature is now available in your Blomming Shop: Now You Can Add Product Variants such as Color and Size directly in the product page. It´s very common to have products that are available in different colors, sizes, styles and to have other slight differences on the same product and the buyer has to choose which combination of those features fits their need. Thinking about that Blomming has introduced the new product variant feature. A product variant (or variant for short) is a different version of a product, such as a size or a color for example. Before, without variants, you had to treat for example: the small, medium and large versions of a shirt as three separate products or ask your costumer to send you a message telling which version of the product did you want. Now you can add a variant Size and when shopping your client can automatically choose which size: small, medium and large, he wants. Add variants to your products is not as complicated as you might first think and you can have a successful product variant running in a matter of minutes and it can increase your sales since it makes a better and simpler shopping experience. Login in and Try it now your customers will love it!